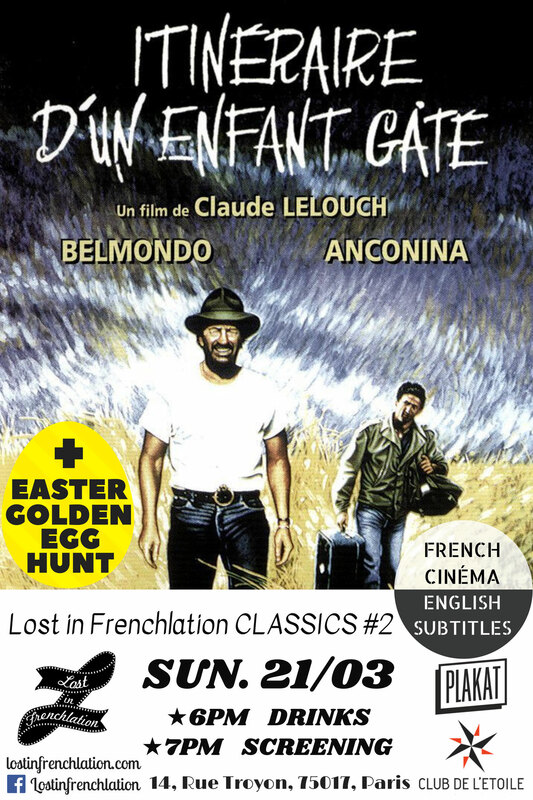 We’ll be screening the second film in our classics series for Easter where you’ll have the chance to a win an « Itineraire d’un Enfant Gâté » unique movie poster from PLAKAT. PLAKAT posters will also be displayed in the cinema and be available to purchase. Bring the whole family to see this classic adventure film! Set in a beautiful African landscape and paired with a wonderful soundtrack, this story of a man at the crossroads of his life is moving and timeless. Lost in Frenchlation and Ciné-Balade have also teamed up to bring you a ☆EIFFEL TOWER MOVIE TOUR☆! Join us from 4:30pm for the tour, 6pm for drinks and 7pm for the film. The screening will take place at Club de l’Étoile cinema, located a short walk from the world-famous Arc de Triomphe! We will be offering a variety of French-inspired drinks and snacks and selling PLAKAT posters during our cocktail hour from 6pm and start the screening at 7pm. Make sure you show up promptly at 6pm for a chance to find the golden egg first and win a PLAKAT poster! Don’t miss this beautiful French adventure film with English subtitles on April 21st! Plakat is a Parisian based company designing alternative movie posters of the most iconic French classics. Each poster is a true piece of art, in very limited editions, numbered and signed by the artist himself, once they’re sold-out, they’re gone forever! Ciné-Balade offers tours to discover how Paris has always been a center in the history of the cinema. Visit Paris and learn how the city embodies cinema. Famous landmarks, unknown buildings, discrete passage ways, highly praised restaurants, forgotten theaters: Paris loves cinema and cinema loves Paris!